Realizing you’re dealing with a termite infestation before it’s too late can be very upsetting news. Sometimes the signs of infestation are hard to spot early on. However, when you know what to look for it’ll be easier to catch the warning signs. Here’s a few things you should check out on your own or with the help of a professional before you have an infestation on your hands. Termites work from the inside out. Before you notice any external damage they may have began eating the inside of the wood on your property. Inspectors are able to detect internal damage from termites by tapping the wood. A low or flat sound will indicate hollowed spaces and termites working within. In the early stages of infestation there may also be a few dried mud tubes visible on your property. These tubes can get larger as the wood reaches the advance stage of disintegration. All wood on your property can harbor termites and help sustain a colony. Inspecting all wooden structures across your land can help you determine whether or not you’re dealing with an infestation. Wood fencing can be the first introduction to your property for termites. A fence can be the first sustainable food source for the bugs as they work their way around the perimeter, then move onto your home. Firewood, fallen limbs or wood mulch can be a welcome flag for them as well. Check any wood on your property for termite life, but also store all wood at least 20 feet from your home. Moisture can reveal exactly what’s going on within the walls of your home. 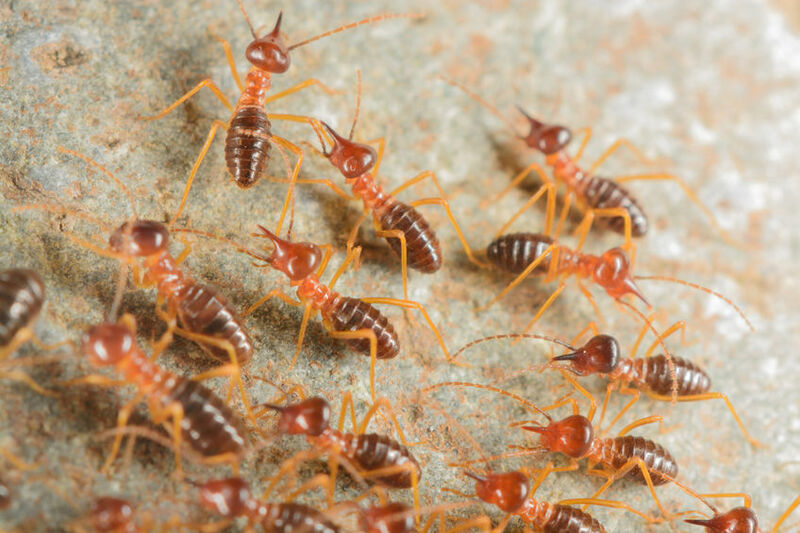 Many species of termite need water to thrive, so they’ll seek out wood in damp climates. These termites are able to get the water they need to survive by consuming wood with high moisture, meaning these levels are very important to know. The vulnerability of your home can depend on how your wood measures up to moisture tests. A termite inspector will be able to give you a professional read of the moisture levels in your home. Any wood near or touching your home can be an attractive source of food for hungry termites. They can provide a good starting point because they are often left undisturbed for long periods of time. Steps, decks and fencing should be inspected just as often as wood inside the home for termite damage. Each point can be the gateway to your home for termite colonies, so be sure to inspect them often and thoroughly. Swarms inside or surrounding your home are a sign that the structure is infested. Swarms inside the home can be found near windows, doors and other lighted areas. Reproductive termites are attracted to light sources and often fly around looking for a mate. Look for swarming groups of termites throughout the day on your property and contact a professional immediately if you detect any swarms. Small tunnels or crevices created with soil, wood cellulose and other material can be an indicator of termites on the property. These can be easy to find once a colony has done extensive damage but difficult in the early stages of infestation. Look for tubes near the house foundation and other access points around the home. Attics, pipes and chimneys can also be a space where mud tubs are present.